The objective of the Learning Center Program (LCP) within Wisconsin/Nicaragua Partners is to provide and promote opportunities to develop skills that will improve vocational options, income, self-sufficiency and empowerment for people living throughout Nicaragua. The leaders and participants meet monthly at the W/NP office in Managua, the last Saturday of each month. Click on the links below to see great photos and experience what variety each month brings as new knowledge is shared with one another. Special thanks to Leonor and Griselda for helping with the monthly reports, and also to all the volunteers in Wisconsin and Nicaragua who dedicate time and effort to the Learning Center Program! 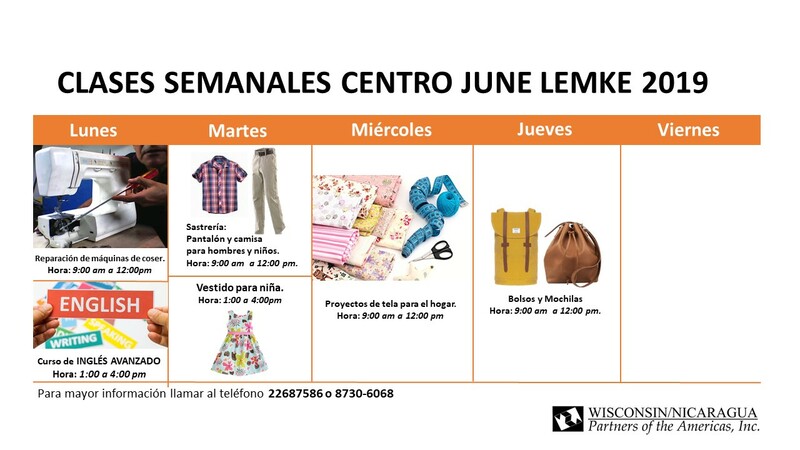 The classes that will be given on the days of each week at the June Lemke Center at the facilities of the Organization of Wisconsin Nicaragua are announced so that everyone who needs to learn new things can participate. The Sherin Bowen Library at the Managua Office is open Wednesdays and Thursdays from 3pm-5pm. Click here for more information on the Sherin Bowen Library or click here for photos and example of special classes for children who attend the library. The average cost of special class is $50 if you would like to sponsor one, please go to the donate page and indicate for Sherin Bowen Library in the description.